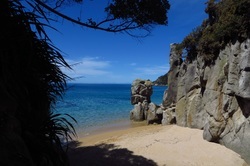 The Northern coastline is the Abel Tasman's best kept secret. We share with you some of the park's finest, quieter beaches, mature native forests and even a seal colony at Spearation Point on this spectacular day walk. We spend the day exploring this magical coastline and stopping along the way at many points of interest. We enjoy our afternoon tea at the historic Wharawharangi homestead, before returning over the Wharawharangi saddle to stunning Wainui Bay.